Well the car in front of me was one of those beat-up used sub-compacts like in the catchy FREE CREDIT REPORT .COM commercials. Seriously, it was even the same color. I didn’t pay them too much attention until they peeled out after completeing their transaction… Real winners, let me tell you. I mean, the squealing tires immediately solidified their “coolness” in my eyes. So I pull up to the ATM and their receipt is still in the machine. Now usually when this sort of thing happens at a gas pump or something, I just grab it, crumple it, and tuck it into my pocket. But due to their obnoxious behaviour, I took at look at the receipt. Can you imagine? I had to look at it twice to make sure I was reading it correctly. Yep, 95 cents. I mean, I’ve run my checking account down pretty low, but never this low. I also thought it was kinda funny how the little advertisement up top is for “Debt Consolidation”. 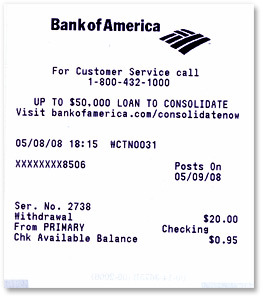 My receipt advertisements are never for stuff like that — usually it’s BoA’s “Keep the Change” program. I wonder what the balance threshold is to get the “Debt Consolidation” header… Under $1 perhaps? Anyway, little things like this make me feel even better about my current financial standing. Debts Falling; Assets Rising...not so much. Cobra Kai: An Enemy Deserves No Mercy! I actually tend to keep my checking accounts this low, too. I use them only when I need to actually write a check to someone (that’s the rent payment, and my vehicle’s tag renewal once a year). Many checking accounts (mine included) don’t pay interest on the money that sits there. Those that do usually offer a very paltry return rate (1% APY or less) or have extreme requirements (extreme to me, that is, at least compared to what they offer — $1,000 minimum balance for 2%? No thanks) to earn interest. My cash reserves sit in savings. Paychecks and other income go into checking but are immediately transfered out to the online savings account, leaving just enough in checking to cover the rent check. A low-balance checking account has a benefit that is very, very handy: anyone that tries to pull off something fraudulent (using a stolen/copied check to do an EFT from the account, etc.) fails, even for low amounts (GreenZap, a supposed PayPal competitor, got bought out last year by a company called “DCL Env, Inc.,” who has now used the bank information they bought to try to nail *every* customer for $19.95 or $19.97), because there isn’t enough in the account to cover it. The net effect? The most I can ever actually be liable for is an overdraft fee if someone succeeds in pulling this off, and if I can demonstrate it’s fraud (pretty easy) even that gets waived. Had I left hundreds sitting in the account, I might not have immediately noticed an unauthorized draft; an overdraft though generates a phone call and a piece of snail mail to get my attention. The only bummer with this is banks tend not to value customers like me that do this. Don’t expect freebies or even an exceptionally helpful staff if you have problems. I mean, you do hear all of the local banks advertising “FREE” checking with no minimums, so perhaps it’s something I should consider but, for me, I like to have access to at least a few hundred dollars from any ATM at any given time. Hear, hear, and that’s *exactly* why I’ve set things up the way I do. The simplest way to avoid any possibility of impulse buys or temptation wrecking a budget is to make your money as “immediately inaccessible” as possible. Yes, there are occasions where having access to a few hundred dollars is a good thing, but these are very easy to anticipate. Otherwise, every drop of income goes into savings except what I use to pay the rent and the bills, and to buy groceries. If I can convince myself it’s worth transferring some cash out of savings (or to keep some extra cash out when transferring *into* savings) for some random gadget or purchase, then fine, I’ll do it.